LAHORE -- A truck bomb in Lahore late Monday (August 7) killed at least two people and injured more than 30 others, according to local officials. The powerful blast, heard throughout the city, created a large crater on Outfall Road. About 200 vehicles were damaged and a nearby building collapsed, police said. 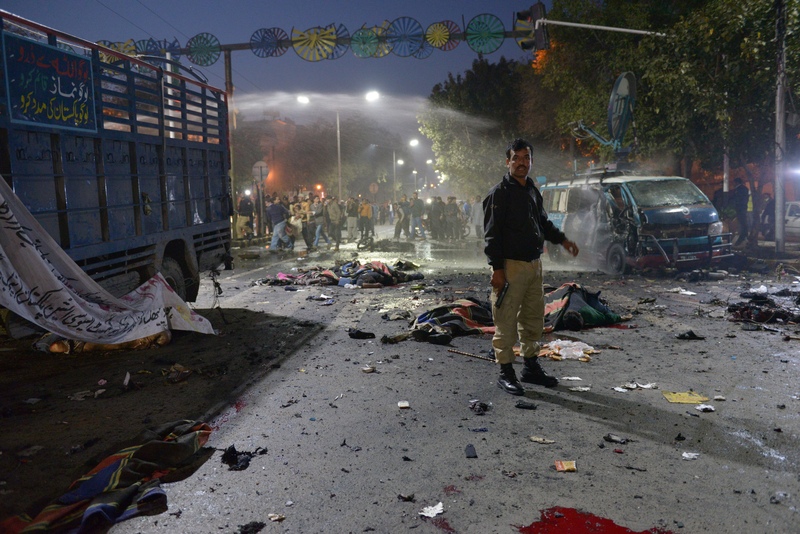 "The explosive material was planted inside a truck which was loaded with fruit," Lahore Commissioner Abdullah Khan Sumbal told AFP, adding that most of the 34 injured were passers-by. Authorities have launched an investigation to determine how and when the truck arrived in the area, he said. Counter Terrorism Department (CTD) personnel gathered evidence at the scene and handed over command of the investigation to Rangers, Dunya News reported. Rescue workers confirmed the number of injured and said a man's body was found in the debris of a nearby house, according to Geo News. Local hospitals admitted and treated the wounded. At least three injured Pakistanis were in critical condition, Jam Sajjad Hussain, a rescue service spokesman, told AFP. "I am still in shock as this blast was so big that it rocked the whole vicinity," Umair Khan, a resident of the area, told Pakistan Forward. "The doors and windowpanes of my house were badly shattered, and cracks appeared in the walls," he said, adding that he was thankful all of his family members were unhurt. The truck had about 100kg of explosives, according to the initial investigation report. Samples of the explosives were sent for forensic tests. "The truck had brought apricots from Swat and was parked for three days," local journalist Irfan Malik told Pakistan Forward, adding, "A local man had informed police about a suspicious smell coming out of the truck." Lahore Capital City Police Officer Amin Wains confirmed that a local man informed police about the truck and that when police were approaching the area, the blast took place. Police have made three arrests in connection with the blast, Punjab Law Minister Rana Sana Ullah said in a statement. "We have contact numbers for the truck driver and conductor and will trace them soon," he said. Punjab Chief Minister Shahbaz Sharif condemned the blast and ordered the concerned authorities to shift all such parking stands from populated areas. He ordered police to intensify searches of vehicles entering Lahore, according to a statement issued to media. No immediate claim of responsibility for the blast was forthcoming, but it follows a string of attacks in Lahore in recent months. Just two weeks ago, on July 24, Tehreek-e-Taliban Pakistan (TTP) claimed responsibility for a suicide bombing at a vegetable market in Lahore that killed 26 people. The bomber was between the ages of 16 and 18, according to police. In April, a TTP suicide bomber targeted a census team in Lahore, killing at least 5 people and injuring 18, including a child. And in February, a TTP-claimed suicide bombing on Mall Road killed at least 15 people, including 6 police officers, and injured 87. Meanwhile, in an unrelated incident late Monday night, police killed four terrorists, a CTD spokesperson said, according to Geo News. Six or seven terrorists had tried to enter the city, the spokesperson said, adding that explosive materials and weapons were recovered from the deceased terrorists. Lahore residents vented their fury at militants and at the government for failing to prevent the attack, despite warnings.